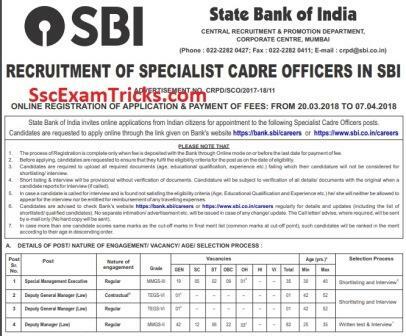 Latest Government Jobs - Are you waiting for SBI SO Law Result 2018? – SBI SO Law Result 2018 Specialist Officer Deputy Manager Law & Executive Scorecard / Merit List Latest Updates – www.sbi.co.in. The final merit list will be prepared from the marks obtained in interview written test and professional test conducted by the bank. The final merit list will be prepared out of 125 marks. The top rank 20 days in each category will be considered for the final selection in State Bank of India for the post of specialist officer in various categories. 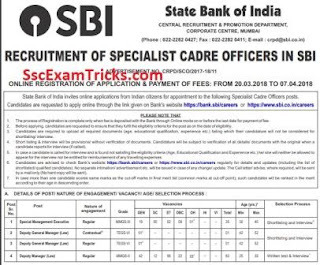 State Bank of India has released notification on 28 March 2018 for recruitment of 119 posts of specialist officer (Deputy Manager in law - Regular and Contract posts) official website www.sbi.co.in. The online application are invited from 28 March 2018 to 7th 21st April 2018. The last date to pay the application form fees is 7th 21st April 2018. The candidates will be selected on the basis of written test (online) and interview. The date of exam will be intimated very soon on official website. SBI SO Law Result will be prepared from marks obtained in written test and interview of the candidate. SBI will send SO Admit card/ interview letter on the email ID of the candidate. Those candidates who have been waiting for SBI SO (Law) Recruitment 2018 can apply online from the link given at the end of the page. The Eligible Candidate must be enrolled in bar Council of India and having the experience as mentioned in the notification. 1. Go to the official website Click on apply online link given at the bottom of the page. 2. New window will be opened. Click on continue button. 3. You can fill basic information like name, email ID, mobile number. Click on save and next button. 4. Upload the signature and photograph of the candidate as per prescribed format. Note - don't forget to note down your registration number and password is displayed on the top of the page. Please take a printout copy of the page before uploading the photograph and signature on the application form. 5. Click on save and next button. Enter the rest of details like educational details, address etc. 6. Click on save and next button to upload the required documents in PDF format. 7. Finally, make the payment of application fees for SBI SO recruitment 2018.